Recently I happened to be in possession of a huge basket with assorted chocolates. Don't even ask me how I came by it - but if you thought - Lucky woman! - then I would have to tell you that its all a matter of perspective. Lucky?- Yes indeed for chocolate lovers and "Oh No- not lucky" for specimens like me who do not like chocolate (curse me all you want to - I have already been damned by chocoholics - which is to say most of the homosapiens - from world over.) My partner in life's crime is ditto my type (trust me to find the other rare specimen) as my loved one ;) I was going through the chocolates one after the other wondering what to do with each of them. Among them were 4 bars of Milk chocolate Toffee bars. After finding nothing in my bookmarks folder for a recipe with this, I searched high and low in the internet for a suitable recipe. Well - nothing interesting showed up. Then, while I was flipping through my regular Vegetarian Times Magazine (I am a happy subscriber and love every edition), the recipe stared at me. 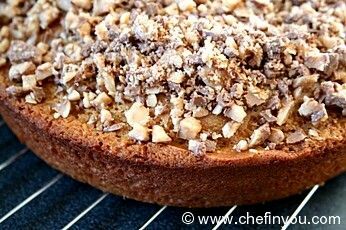 It was like the Toffee angels smiled at me - I mean the recipe literally fell into my hands :) The magazine had this easy looking Cake recipe which already had been made "light" from the original Brown Sugar Pound Cake recipe. I decided to make it a tad lighter - just a tad bit - from this already low fat version. It stood the test well and came out delicious looking and tasting from what my taste testers informed me. I made the cake during the evening and by next noon it was all gone! So for all the sweet toothed foodies, this has your name written on it. 1. 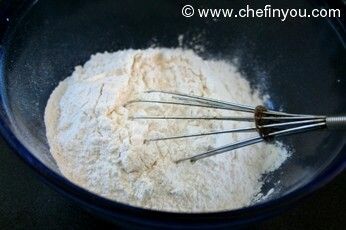 Whisk together flour, soda, baking powder and salt in a bowl. 2. 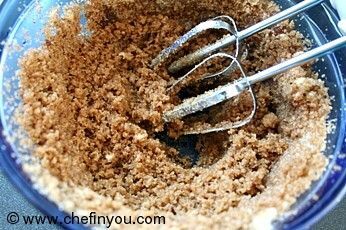 Beat butter, oil, brown sugar and sugar until smooth in separate bowl. 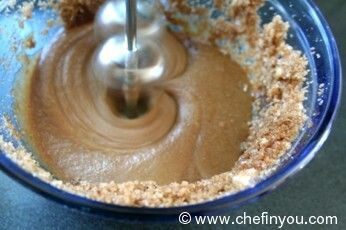 4. and then beat in coffee and vanilla extract. 5. Add 1/4 cup yogurt and beat until smooth. 6. 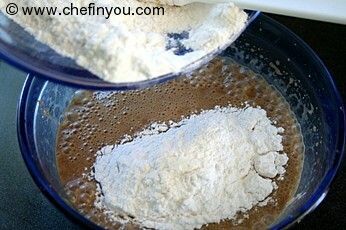 Add half of flour mixture and beat until smooth. 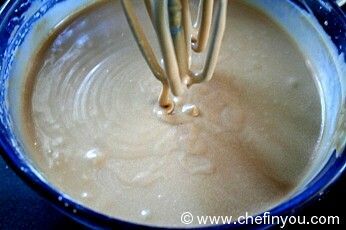 Beat in remaining 1/4 cup yogurt, then remaining flour mixture. 7. Beat 2 to 3 minutes, or until batter is smooth and creamy. 9. and bake in a preheated 325F Oven for 35 to 40 minutes, or until toothpick inserted in center comes out clean. Cool 10 minutes. 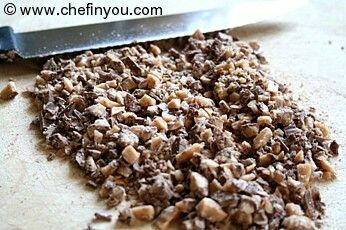 Meanwhile, chop the chocolate bars into small pieces. Its fine if some pieces are a bit larger than others. 10. Unmold cake from pan, and set on wire rack. 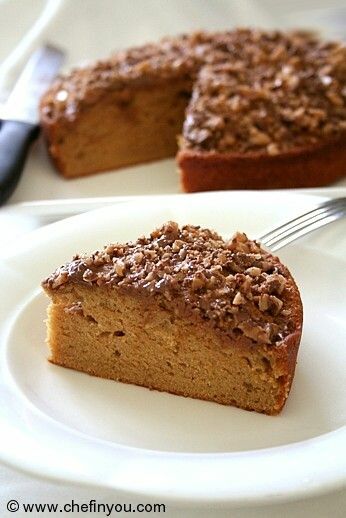 Sprinkle chocolate-toffee bits on top of cake while hot. Cool completely before serving. 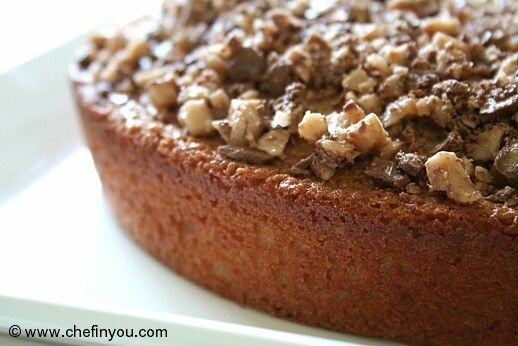 While its cooling, you will see that the toffee bits on top are slowly melting on the surface of the cake. If you happen to touch it, your hands will be sticky with all that melting toffee (just a warning for you if your kids think of sneaking few pieces from top while its cooling while you are not looking ;) So if you suddenly find them licking their fingers you know what they were doing :)) Cut them into slices and serve warm :) The magazine suggested that you can enjoy them with Vanilla Ice Cream. Did I just switch on the drool switch in your mouth????? I made these today for our guests and it was an instant hit!!! Served it with vanilla ice-cream and it was just yumm!! Thank you once again!! This cake was wonderful- all of us loved it! served it warm with Ice cream. I used 2 whole eggs and reduced a bit of butter and instead added little oil. Additionally used some mini chocolate chips for topping along with toffees. Hi DK; this sounds really yummy.. Since I havent tasted this heath bar; I am unable to decide the indian substitude of this. Can you please suggest any best fit ?? Thanks. Really love your site. can i substitute the milk chocolate toffeee bars with five star bars... ? Hi DK, I made this cake today, but with a few variations. 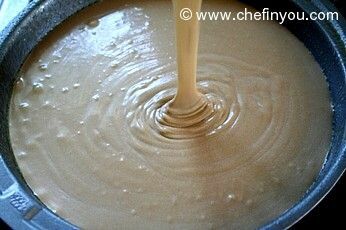 Being in India, i couldn't get the brand of Toffee bars mentioned in this recipe. And my 2 yrs old daughter was also gonna eat this cake , so i didn't want her to consume caffeine. So here's what i did. I substituted : 3 tbsp butter with Nutralite butter (salted), so i didnt add the salt. Vegetable oil with Olive oil, trust me there wasn't much difference. 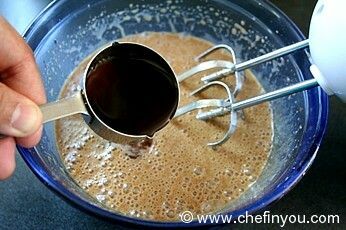 Coffee solution with cocoa powder solution. 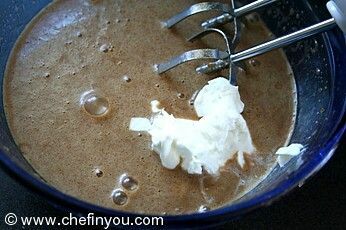 (3 tbsp cocoa powder in 1/4 cup of boiling water) and then refrigerated it. Didn't get the toffee bars, so i just chopped up Bourneville dark chocolate, 90 grams bar into tiney peices and added it in the batter itself. The cake has turned out extremely tasty, with little peices of chocolate peaking out here and there, and it is super soft and fluffy. Thanks a Ton for sharing this recipe with us. Even after making variations of my own the first ever time that i was trying out this cake, it has turned out really well. Hi DK This is another one I definitely will try. It looks scrumptious. But what can I replace the coffee with - can't have coffee have bad reaction. Grateful for reply. 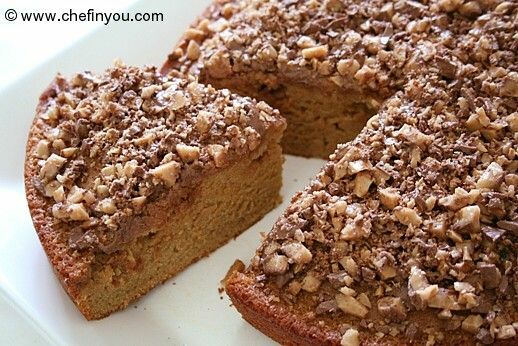 Hi DK, I would like to try your Brown Sugar Toffee Cake. I happen to notice that the ingredients require egg whites. As I'm a strict vegetarian I would like to know how I can replace this in your recipe. Awaiting to hear from you. 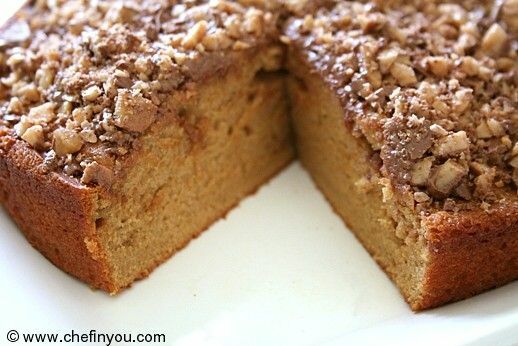 I made this, but I used praline instead of toffee and it tasted just as good! My family loved this cake, they wanted more! Made this cake over the weekend. I used wheat flour instead of all-purpose. Turned out awsome! It was gone in few min in our house :-P . THX for the recipe! your cake looks incredible!! I am so happy to have found your blog! I will definitely be back! 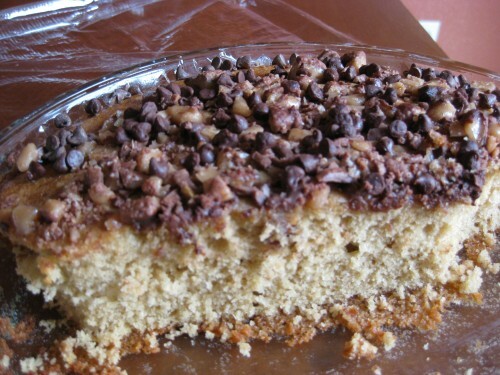 MMM...that such a neat idea to use the chocolate bars in a cake. Looks scrumptious!! 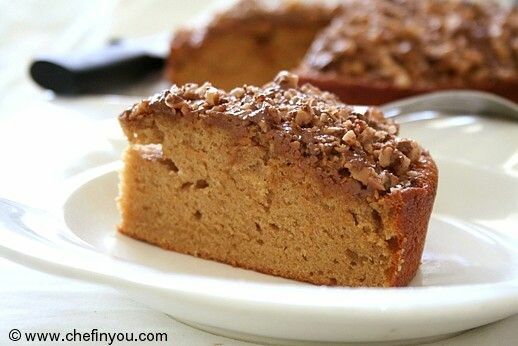 Gorgeous toffee cake, looks scrumptious..
Aha.... this is my kind of cake. Love the pictures. Thank you for finding and presenting it to us :). Did you use instant coffee or espresso kind? I would usually use Instant coffee cos I have the Indian brand - but this time I had some Espresso freshly brewed hence used it.